Would you give this Baby Doll a home in time for the holidays? She's little, weighs around 15 pounds and is around 2 years old. She is fine with other dogs, fine with cats. She was given up because the owner was moving. We would love to find her a home with another dog or as a single dog. Short video fo her being handled http://www.youtube.com/watch?v=VMI6lIwLd6g&feature=youtu.be Her foster mom says about her: She's doing great!! She's really a good girl. She settled right in and is very happy here. She is eating and is completely house trained. She slept through the night in her crate with no problems and Nick has been working with her to crate train her during the day as well. She is very sweet - loves to give kisses to everyone. She's going to make someone a wonderful pet. Baby Ruth is a tiny mix breed from Anguilla. She's been in a foster home and is doing great on house training. We strongly recommend crate training and letting her out before and after breakfast, lunch and dinner. She sleeps in her crate through the night. She will sit for a treat nicely, but will need ongoing training. We require puppy K and then basic obedience. She is teething and would do well with a chewie in her crate. She is very playful and doesn't understand no from either the dog or cat. She loves it when you sweep the floor and chases the broom. She loves to sit on your lap or cuddle up on your shoulder, but is not a lap dog as she is too playful most of the time. 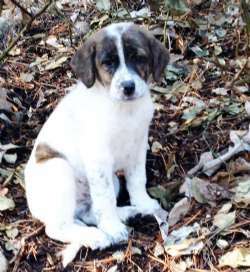 She is a typically playful, active puppy who will need someone with her during the day. three hours alone tops for the whole day would be okay. Please fill out the application ahead of time so that we can have it printed when you come to meet her. Bella is a lab heeler mix about 4 months old Bella was another TN animal shelter dog that came to the shelter right before Christmas. You couldn't find a happier more lovable pup. She and Vixen were sharing a kennel at the shelter and have been BFF's please look at the perfect heart on her side, this is perfect as she is all about love and kisses. 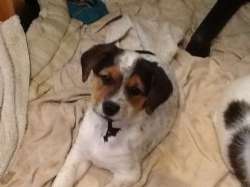 She has a lot of spots and as she gets older may get more, .She enjoys naps in the crate and has been doing fairly well on house training going outside most of the time. She walks very happily on leash and does not jump on you unless she is way too excited. Training is going to be important as she will be large. She has all lab traits and few heeler traits, very seldom does she bark, or chew unauthorized human belongings, she is super happy with her toys. Brie is an exceptionally beautiful girl who has a lot to offer an adopter. Brie weighs around 50 lbs. now, and at her age she is full grown, however she could afford to put on a few pounds and still maintain her svelte figure. She's a very smart and very sweet dog. Someone is going to be smitten with her quickly! She is a beautiful fawn [reddish orange] with a glistening black nose, and the biggest brown ‘cow’ eyes that will melt your hearts. We patiently waited for Brie to be ready to undergo her spay surgery – as she is well worth the wait! Brie is on the upside from a long bout of demodectic mange. She is almost two years old now. She has been with her foster family for a while – and has learned so much during this time. She knows ‘sit’ and ‘come’ and will walk on a leash with some coaxing. She will sleep in her crate, or wherever you allow her to sleep. She will ride in a car as long as she is allowed to stay in the well of the back seat. Brie is living with two large male dogs and she would love a similar situation or with one male. She was part of a large litter (Pippa is her sister). Because she is happiest when with other dogs, we are looking for a home where there is at least one other dog. A fenced in yard is a must as she still has a tendency to explore her surroundings, and we would die if she ran off. If you are interested in meeting her, please fill out an online application and we will get back to you as soon as possible. She is in a foster home so private appointments will need to be made. 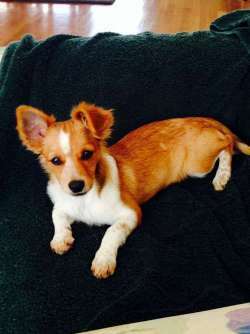 Brody is a 5 month old Poo-chi who weighs approximately 6 lbs. 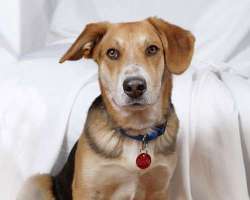 Brody has not had any stability in his young life as he has had multiple owners and really will need to find a family that can provide him with stability, companionship, and consistency. He is outgoing and adorable and we're asking for a stay-at-home situation for him with someone who will take him to puppy kindergarten and follow our holistic protocol. He is available on 1/18/14. Brooklyn is an adorable 3 month old puppy who ended up in a shelter. She is playful and affectionate and we're looking for a loving home for her with someone who is home during the day and who has the stability to offer her a forever home. If you already have an application on file and would like to apply it to this puppy, please email adoptions@saveadog.org. Otherwise, better hurry and fill out the online application so you don't miss out. She is available as of 1/4/14. Candie is a cute little blonde retriever mix who is about 1 year old. She is very sweet. She was in a shelter in TN and is already spayed. She will be available 1/18/14. She does have a strong application for her already. Carsie is a stunning white color with blue eyes and white lashes. But her fantastic temperament is what makes her so special. It’s amazing that this dog wound up at the shelter. She’s recently been in foster care and has won everyone’s hearts, including 3 dogs and 3 cats. She’s very smart and teachable, walks on a leash, travels well in a car, and knows how to sit and shake. She LOVES water. Carsie wants to bond with one person but gets along with everyone. She is not a barker at all. Because of her age, she will require a knowledgeable home that is willing to put the required work into her. Setting boundaries with firmness, consistency and love is very important. Carsie is a gentle natured dog but she needs to respect the person who is working with her. The investment will be invaluable as she is loyal, loving and an absolute delight to be around. Her first encounter with a child was an experience not lost on her fosters. Walking her past a very young child, Carsie dropped to the pavement, rolled over in front of the child and showed her tummy. She needs to be in a home that will give her the training, attention and love she deserves. She is available 1/11. Celia is 26 lbs. a sweet, gentle girl. She was pulled from the shelter pregnant by our TN fosters and she had 8 beautiful babies 2 weeks later. Celia is a dream dog. She loves her 2 mile walk every day, she never pulls on the leash. She will jump right into the car and likes to sit on the center and look out the front window. Celia loves all the other foster dogs and has paid no attention to cats. She loves to be pet and have her belly rubbed. She is not a fan of the crate yet but will learn in time. Once she is in it she settles down for the night and will not wake until morning. She is 100% housebroken with a dog door. She has a natural bobbed tail which she passed on to a few of her babies! She is inquisitive outside in the dark so her fosters go out with her for last call. She is scheduled to be spayed next week. This is Cheri 1 yr old Boston Terrier mix. 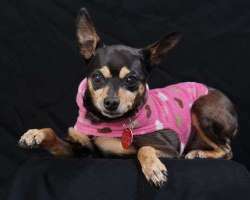 She is about 19 lbs Cheri is as sweet as they come, she is a wonderful compact size and gets along famously with all the dogs in her foster home. She was rescued from the animal shelter in TN. Cheri has had a very sad start in life, but that is all behind her now and her future is bright. When she came to the shelter she was afflicted with cherry eye, both eyes were just a mess and as she was living with that misery she also had loss of fur due to flea allergies, so as pretty as she looks now, she had a sad beginning. Cheri is great with cats, really wants no trouble with them. She is adapting to her crate very well, she is playful and would do well with another playful dog her size. She pulls on her leash so a harness would be best for her. Some training would be a plus as all she knows right now is to be completely adorable. We are looking for a palace for this little Cinderella girl. She deserves the happiest ending. DAGWOOD FOUND HIS FOREVER HOME WITH HIS FOSTER FAMILY! WIN/WIN! HE HAD HIS SURGERY AND HAS RECOVERED BEAUTIFULLY! 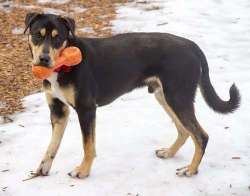 Dagwood is a very friendly, young Dobie mix male who is neutered and ready for his adoptive home. His leg was broken a long time ago, and has healed without proper medical intervention. We had him evaluated by our Ortho Veterinarian and due to his extensive nerve and tendon damage, he needed the surgery to remove the leg, so he will be going to his adoptive home as a tripod. 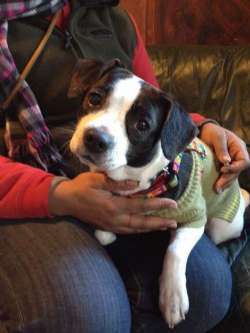 Dagwood has a winsome personality and is an otherwise healthy, young dog. The vet and techs LOVED him.. A very sweet and personable boy!! When found he was starved so he will have a great life from here on out -- we promise him that! He is 8 months old and weighs 50 pounds. He is fine with other dogs. Seems scared of cats. No resource guarding - He's fine with you taking his food away - oddly enough - you'd think he'd challenge you for it but he doesn't. He's very loving . He was a stray. 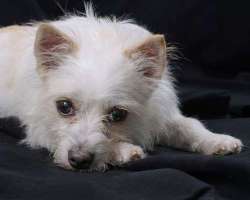 Daisy is a sweet 6 to 7 year old mini pin mix. This sweet, quite and calm girl was rescued from a rural shelter in TN. 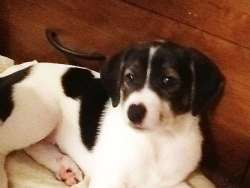 Daisy rides excellent in the car, uses a doggy door, sleeps through the night and loves her foster sisters and brothers. She even likes the three cats she lives with. Daisy has an old injury on her front leg but it doesn't seem to give her any pain. She still loves to go for short walks and will sit patiently while you put her leash on. Daisy is good with children but prefers older calmer people. Daisy's most favorite thing in the whole world is her blankets. She will sleep for hours in her little nest all snuggled up. So make sure she has a supper snuggly one to get warm and cozy in. Come meet her at our shelter during our shelter hours, Sat and Sun from 12-3 PM, starting 1/11/14. Dupree was most likely dumped but luckily wandered up to the right home in the middle of a storm. Since then he’s been thriving in foster care and they are shocked that someone would discard such a precious guy. He is 100% housebroken and has never lifted his leg once in the house. He gets along well with other dogs but because of his size would be more suited to smaller dogs. He likes cats as well. He has “old soul” eyes that reach right into your heart. He is a beautiful white and buff color and weighs less than 10 lbs. He has a very sweet quiet temperament, is not a barker at all, and has a friendly wag for everyone he meets. He enjoys being petted and sitting on a lap but also likes to find his own spot. Dupree would do well in a loving, happy family who allows him to fit into the home at his own pace. We do already have a very strong appliation for Dupree. We have a very strong application for him and will take back ups. He is available 1/11/13. Check out Jangles. He was posing for his portrait and looks serious, but if you meet him you will see that he is just the silliest, most fun-loving pup. He came up with his brother, Jingles, and we were hoping to place them together, but it was not happening, so we decided that as long as each could have a dog friend, that they would be fine. So Jingles got adopted and now it's Jangles turn. A fenced in yard is preferred, especially if you have a busy household or children. They will try to chase cats or squirrels. Any missing sock or towel can be found in his crate, unmolested. He is a very sweet pup, under a year old, already neutered and up to date on vaccines. Already had kennel cough so does not need that vaccine (it doesn't work anyway). He is on Fromm food, which is a high quality food. He is all set to go and would love a home soon! Come meet him at our shelter on weekends from 12-3 PM. Or fill out an application for a private appointment. You won't be disappointed! 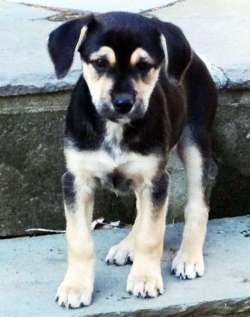 Kristen is a beautiful 4.5 months old, female collie/ Shep mix. She came to a TN animal shelter as a stray. She loves to play all day. She was in a foster home for a month in TN so is very acclimated to home life and they use the dog door to go outside to play and do her business. Life has been care-free for her in the home with multiple dogs and cats. Now she is ready for a family of her own. She is quiet in the crate and has done very well on house training. She doesn't bother the foster cats and is areally good girl. She is at the stage in her growth where she is tripping over her feet. We require Shepherd experience so is familiar are with the breed. Her foster mom says: Kristen is doing much better and has settled in pretty well. Crate training went really well and she has gone 2 days without an accidents and is spending a good amount of time out of crate after each success. She has also started to give us clues like going to the door. We knew she was smart. She does not like to be alone at night in her crate, but is getting better.Please fill out an application if you are interested or come see them during our showings. 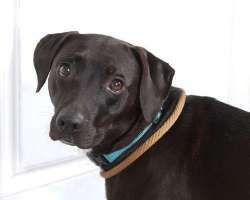 Lily is a young, athletic, Lab mix who who already has some obedience training and is housebroken. She is an easy keeper for the most part. She has a prey drive so cannot go with cats, birds, or small animals. 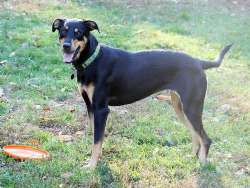 She is 2 years old, spayed, and seems to be mostly Lab with a little Cattle dog or Shepherd mixed in. She might have a touch of bully breed. She is a nice dog, athletic and loves to play. She really impressed us at a recent Petco event when she sat and performed obedience commands for the crowds of people petting her. She is one AMAZING DOG!! Like any young dog, she needs regular exercise. At home she can be calm and can be left alone without being destructive. She greets her people cheerfully at the door. She will prance engagingly and she endears herself to everyone she meets. She is very smart and with consistent training can be very clever and obedient. With children she is sweet and boisterous but still jumpy so best with older kids. She was sometimes protective on leash, but we have only seen this behavior when she has not had enough exercise. She will pull if she sees a squirrel. She is best in a cat-free home as she will chase. Other than that she is a delightful dog who is house trained and already spayed and up to date on vaccines. She is used to a country life so might do best in a suburban rather than urban setting. She is about 46lbs. 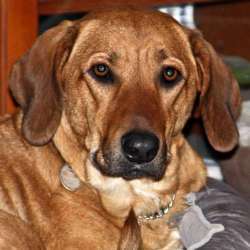 Her foster mom says: Lily has adjusted to her foster home very well and is really friendly to my family. She sleeps in the crate and has no problems getting through the night. Lily even walks into the crate when told and doesn't need to be assisted in. She eats well and is very muscular. She loves the toys we have and I recommend sturdy toys since she can easily de-stuff cloth toys. Lily loves treats and bones to chew on. She does best in a fenced in yard so that she can run around and have some off-leash time. She is available now and is at our shelter. Please give this wonderful dog a chance! 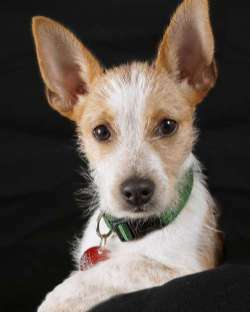 Lou is a young, very sweet, 1-2 year old Jack Russell mix who was found in rural TN about a month ago. He was wandering all alone. He was in bad shape but has recovered nicely and is ready for his family. Lou is super cute and wants to see where you are as he learns to be alone. He has been neutered and is not a marker. Lou is house-trained with a doggie door and is doing better everyday with crate training. Lou is great with cats and other dogs. He is great on leash and in the car. There is not a mean bone in this little guys body; he will be a wonderful pet for some lucky family. His foster mom says: Lou is a very sweet and affectionate boy. He is very calm, friendly and quiet. He is great with other dogs and loves his toys. We would love a home with another little dogs to play with. He is house-trained and does great in his crate. We prefer a part time worker or stay at home person as he has never had a family of his own and it is his time for attention! Whoever adopts him will be so lucky because his disposition is wonderful. He has a very cute underbite that will make you smile! He loves being around people and getting attention and affection. Apply at www.saveadog.org. Luane is a sweet little girl from St. Thomas. She's a Jack/Rat, a Jack Russell / Rat Terrier mix, with feature from both. She's a very smart little girl and beyond cute. She has short legs and a fuzzy face. We're all smitten with her. She's very tiny, around 5 or 6 lbs. She needs a stay at home or work from home or flexible hours where people can be with her. Children tweens and up, would be fine. She's very playful. Here's what her foster mom says about her: Luanne is a very lovable, happy and outgoing little puppy who will snuggle and not leave your side. She sleeps all night in her crate, will squeak to go out. 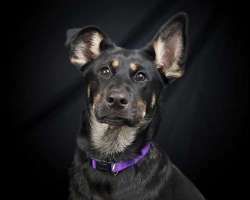 While she is a little nervous in the car, she loves hiking outdoors (Boy Scout Camp trails) and is learning about loose leash walking, She plays fetch with her toys & will entertain herself as well, rassling up her toys and running all over the house. Puppy Behavior--Chases the cat, is easily distracted from chasing but will go back to chasing when unsupervised. HIghly motivated to “come” and “sit” when clicker training/treats involved. If she is chasing the cat all bets are off. Does not hear you. Moves very fast, loves to run. The puppy pen is attached to the crate. If she gets anxious she will bark, yip, squeak, whine, cry, jump, twirl, climb up the pen & escape over the side. Working on trying to make the pen and crate a more positive experience where she eats, sleeps and entertains herself. Likes to unpack her toys from a box & bring them into her crate to play with. Loves to chew, will take her toy where you can’t see her, put toy down and chew on something that may be dangerous. Cords, channel changer, water bottles, shoes, furniture legs. Knows “drop it’, she will bite up sticks outside, once got an acorn, is good about dropping it but you have to tell her. Also good about giving you her toys to throw with “drop it”. Working on separation-- she likes to be able to see you, try to get her exhausted through exercise, play & training, then let her chew a bully stick in her crate, she will fall asleep by herself & sleep soundly for a nap a few times a day and at night from 10 pm to 5 am. Lucky and Chance are 7 year old brothers whose owner passed away suddenly. They are so so sad but are the sweetest boys and are very bonded so must find a home together! They are 7 yr old brothers, with Lucky being the larger one on the left and Chance being the smaller one. They are inseparable. 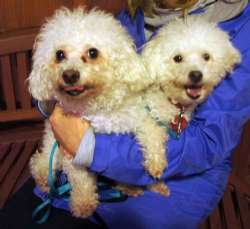 They were rescued from a puppy mill shutdown when they were 8 weeks and have been with a single man their whole lives. They are about 9 and 10 lbs. and are in good health, but we will have our vet examine them. They just got a bath and they were angels. They want to sit in your lap as they are scared and sad. Their owner most likely had a heart attack and they were with him for a day alone before he was found. How tragic. They are crate trained and walk on a leash fine, but they do need some reinforcing with being house trained. This is probably due to the traumatic week they have had. The ideal situation for them would be a quiet home where their family is not gone too long, as they long for human companionship. They are in a foster home and will be brought to the shelter to meet you by private appointment once we receive your application. 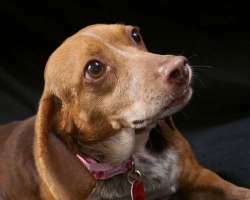 Lucy is a petite 17 lb beagle who is about 4+ years old. She could be younger but has broken and missing teeth, so the vet thought older (they go by the condition of the teeth). If you are looking for something sweet little Lucy is your girl. Lucy is from the TN animal shelter and is deserving of a great home because she is just perfect . Lucy is good with all the dogs in foster, even 8 six week old puppies, she is 100% house trained uses a dog door is very quiet. She has had a rough life up until now. She does have a dental issue that is being addressed. Available 1/11/14. Her foster mom says about her: Lucy is 100% housebroken, not one accident, she eats good. She loves everyone and every dog she meets, likes to play with toys and loves to play with other dogs, especially ones her size. She is also very happy and snuggles right up to me. I honestly have nothing bad to say about her, she walks on a leash and loves to be outside. Crate, she wasn't a big fan but settled in and slept through the night, got up when I got up at 7:30. Quiet, she makes a squeaky sound when happy and does bark but rarely (usually just copying my dog). Marianne is a sweet little girl from St. Thomas. She's 3 to 4 months old and she looks like a miniature collie, so cute. She's a very smart little girl and beyond cute. We're all smitten with her. She's very tiny, around 5 or 6 lbs. She needs a stay at home or work from home or flexible hours where people can be with her. Children tweens and up, would be fine. She's very playful. She's a really easy pup, quiet and sweet. Matlock is a 9 lb Peke-a-tese mix of Peke and Maltese. He is the sweetest dog that loves to cuddle and give kisses. Matlock was dropped off at the shelter on a freezing day. He does not show any emotional issues of abuse or neglect. He is good with both dogs and cats and loves everyone that comes into the house. His foster finds he has a good appetite and not picky and does very little barking He likes his crate and goes in at night without complaint and sleeps in it sometimes during the day. He's adjusted fine in his foster's home and we have not found him to be needy after a day in her house he fit right in. He's in a foster home but is brought to the shelter on our visiting days (Sat and Sun 12-3). Hi there! My name is Maxey and I'm very cute! I am all ready to be adopted. I was neutered on 10/29 when I was 6 months old. I was 28.6 lbs at surgery time. I'm a nice little dog -- I'm tan with black accents. I'm very friendly and social with people and dogs. I love to play with my good pal, Tye, the husky. I'm available now that I've had my health check-up. I have a clean bill of health. Update: Princessa met the love of her life at the vet hospital where she is being spayed. We're 90% sure she is getting adopted. 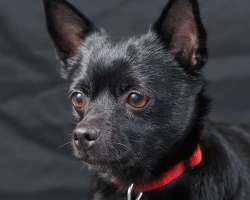 Princessa is an 18 month old "Jack Rat" who just arrived. She is a very popular breed so please get your application in as soon as you can. Jack Rats are a lot of fun and they are a nice size. They are super smart and Princessa is no different. She is just darling and can jump like a jumping bean but is not crazy with energy. She desperately wants her own person and will not disappoint. She was surrendered by her owner in St. Thomas in May 2013. When she her time was up she got a ride to MA from a loving traveler who paid her airfare. She is very sweet and loves attention and affection. She will be spayed on Tuesday the 7th, then will be available after a brief recovery period. She will not be at the Petco event this weekend. Reba is an adorable pup who is a beautiful blend of several breeds. Celia's Puppies were born on November 19th. They all love to be held like babies and have their bellies rubbed. They will roll over on their backs and will lay there forever if you rub their tummies and scratch their ears. They love to be held. They will shoot around the house like little devils and then as soon as you pick them up they will melt in your arms. They will also go potty outside if you remember to take them out about every hour. They are paper trained but prefer to do their business outside. A fenced in yard or area is best as they are not yet leash trained. A harness with leash is a good way to leash train a puppy. They run and wrestle for hours and then plop down for a long nap, wake up and go again.They are puppies though, with sharp claws and sharp teeth, so small children are not advised. They love to eat shoelaces and tug and climb on pant legs. They are so young they will need a stay at home situation in order to be properly socialized -- the rule of thumb is not more than one hour alone for each month of the puppy's age. Please note we do not spay and neuter young puppies as it causes health problems later on. Spaying and neutering upon maturity is a requirement, however. Please apply online, no phone calls please. We will show them by appointment on Monday, the 20th. 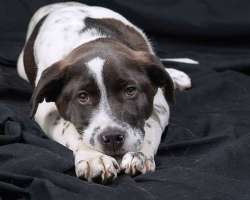 Rhoda is the largest female puppy, but is also very sweet in nature and gentle. Celia's Puppies were born on November 19th. They all love to be held like babies and have their bellies rubbed. They will roll over on their backs and will lay there forever if you rub their tummies and scratch their ears. They love to be held. They will shoot around the house like little devils and then as soon as you pick them up they will melt in your arms. They will also go potty outside if you remember to take them out about every hour. They are paper trained but prefer to do their business outside. A fenced in yard or area is best as they are not yet leash trained. A harness with leash is a good way to leash train a puppy. They run and wrestle for hours and then plop down for a long nap, wake up and go again.They are puppies though, with sharp claws and sharp teeth, so small children are not advised. They love to eat shoelaces and tug and climb on pant legs. They are so young they will need a stay at home situation in order to be properly socialized -- the rule of thumb is not more than one hour alone for each month of the puppy's age. Please note we do not spay and neuter young puppies as it causes health problems later on. Spaying and neutering upon maturity is a requirement, however. Please apply online, no phone calls please. We will show them by appointment on Thursday, Jan 23rd 2-4pm. Meet Rita. She is a sweet and pretty quiet pup. Celia's Puppies were born on November 19th. They all love to be held like babies and have their bellies rubbed. They will roll over on their backs and will lay there forever if you rub their tummies and scratch their ears. They love to be held. They will shoot around the house like little devils and then as soon as you pick them up they will melt in your arms. They will also go potty outside if you remember to take them out about every hour. They are paper trained but prefer to do their business outside. 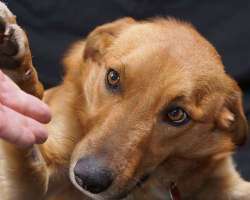 A fenced in yard or area is best as they are not yet leash trained. A harness with leash is a good way to leash train a puppy. They run and wrestle for hours and then plop down for a long nap, wake up and go again.They are puppies though, with sharp claws and sharp teeth, so small children are not advised. They love to eat shoelaces and tug and climb on pant legs. They are so young they will need a stay at home situation in order to be properly socialized -- the rule of thumb is not more than one hour alone for each month of the puppy's age. Please note we do not spay and neuter young puppies as it causes health problems later on. Spaying and neutering upon maturity is a requirement, however. Please apply online, no phone calls please. We will show them by appointment on Thursday, Jan 23rd 2-4pm. 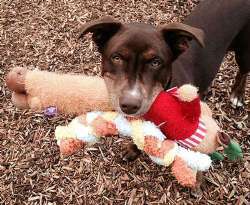 Roscoe is a 7 month old male chocolate lab mix. He is a fun, loving, handsome, and smart young pup. He was dumped off near a home in TN. The people took care of him but couldn't keep him so they contacted a Save A Dog volunteer so he wouldn't have to go to the animal shelter. He has been fine with their children and cats in foster, but will need training as he will be a large dog when fully grown. He loves to play with dogs but plays rough so smaller friends may get a bit overwhelmed by him. He will respond very well to training; he very much wants to please. He walks well by leash already, and loves fetch (he will bring a ball back to you to throw again! ), walks, and car rides. He has some crate training but will need his puppy lessons in your home. Lab lovers here is your guy! He is neutered. 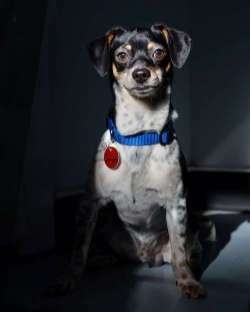 Rowdy is a small male pup who doesn't exactly live up to his name, so don't be frightened off. He is a sweet and quiet pup. Celia's Puppies were born on November 19th. They all love to be held like babies and have their bellies rubbed. They will roll over on their backs and will lay there forever if you rub their tummies and scratch their ears. They love to be held. They will shoot around the house like little devils and then as soon as you pick them up they will melt in your arms. They will also go potty outside if you remember to take them out about every hour. They are paper trained but prefer to do their business outside. A fenced in yard or area is best as they are not yet leash trained. A harness with leash is a good way to leash train a puppy. They run and wrestle for hours and then plop down for a long nap, wake up and go again.They are puppies though, with sharp claws and sharp teeth, so small children are not advised. They love to eat shoelaces and tug and climb on pant legs. They are so young they will need a stay at home situation in order to be properly socialized -- the rule of thumb is not more than one hour alone for each month of the puppy's age. Please note we do not spay and neuter young puppies as it causes health problems later on. Spaying and neutering upon maturity is a requirement, however. Please apply online, no phone calls please. We will show them by appointment on Monday, the 20th. Meet Roxy. She has one blue eye and one brown eye. She has the terrier coat and personality. Roxy is super smart and is very affectionate. She is already 99% housebroken. She loves to play and is very active. She would be great in a terrier-experienced home with older kids, like 12 and up as she is going through the teething stage and her little teeth are quite sharp. 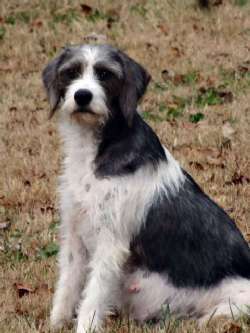 Her mom, Celia, is a Wire-haired terrier mix. Celia's Puppies were born on November 19th. They all love to be held like babies and have their bellies rubbed. They will roll over on their backs and will lay there forever if you rub their tummies and scratch their ears. They love to be held. They will shoot around the house like little devils and then as soon as you pick them up they will melt in your arms. They will also go potty outside if you remember to take them out about every hour. They are paper trained but prefer to do their business outside. A fenced in yard or area is best as they are not yet leash trained. A harness with leash is a good way to leash train a puppy. They run and wrestle for hours and then plop down for a long nap, wake up and go again.They are puppies though, with sharp claws and sharp teeth, so small children are not advised. They love to eat shoelaces and tug and climb on pant legs. 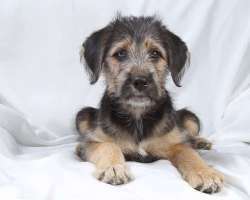 They are so young they will need a stay at home situation in order to be properly socialized -- the rule of thumb is not more than one hour alone for each month of the puppy's age. Please note we do not spay and neuter young puppies as it causes health problems later on. Spaying and neutering upon maturity is a requirement, however. Please apply online, no phone calls please. We will show them by appointment on Thursday, the 23rd from 2-4 PM at our shelter. Meet Rue, a darling female pup. She is quiet and cuddly. Celia's Puppies were born on November 19th. They all love to be held like babies and have their bellies rubbed. They will roll over on their backs and will lay there forever if you rub their tummies and scratch their ears. They love to be held. They will shoot around the house like little devils and then as soon as you pick them up they will melt in your arms. They will also go potty outside if you remember to take them out about every hour. They are paper trained but prefer to do their business outside. A fenced in yard or area is best as they are not yet leash trained. A harness with leash is a good way to leash train a puppy. They run and wrestle for hours and then plop down for a long nap, wake up and go again.They are puppies though, with sharp claws and sharp teeth, so small children are not advised. They love to eat shoelaces and tug and climb on pant legs. They are so young they will need a stay at home situation in order to be properly socialized -- the rule of thumb is not more than one hour alone for each month of the puppy's age. Please note we do not spay and neuter young puppies as it causes health problems later on. Spaying and neutering upon maturity is a requirement, however. Please apply online, no phone calls please. We will show them by appointment on Monday, the 20th. 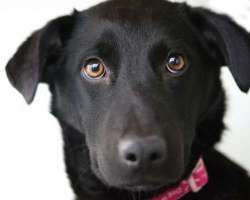 Sassy is a very friendly Black Lab who is 3 years old. She loves cats and dogs and of course people. 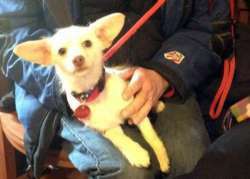 She was given up by her owner, an elderly person that had her since she was a little puppy. Sassy did not get much attention and was kept alone in a very small yard. She is in a multiple dog foster home and is having a blast. She is very playful and wants everyone to join in. She is catching up on all the fun she missed as a puppy. She is learning to love the crate. She walks on leash, and typical lab wants to be with people all the time. Sassy is an active girl so will need an active adopter. 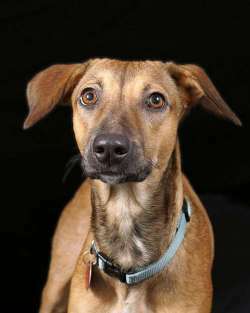 Smidge is a young Dobie mix who needs a dog-savvy adopter. 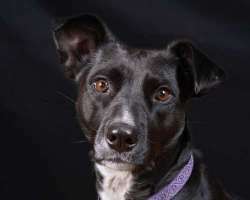 She is great in her foster home with off leash introductions, but is not good with on-leash intros, with people or dogs. She is EXTREMELY smart and extremely affectionate and extremely loyal. She is one very loyal dog to her people but should be with adult children not young ones. She would be perfect for a single person or couple who live off the beaten track, but she has done very well in the suburban environment too. She is one of the smartest dogs we've had in a long time. She will even arrange her bedding to give herself a good vantage point so she can see her care takers coming and going. She loves her people and it doesn't take too long to warm up, but she will bark at strangers or new people who come into the house. She performs her obedience commands with gusto! When given the down command she flies down with amazing speed, especially if there's roast beef involved. She loves her frisbee and will toss it herself. With a confident dog handler she will flourish. She smiles. She's goofy and playful! She's good for her baths and she likes other dogs that she plays with at the shelter. She spent a couple of months in a doggy daycare and did great. She's going to LOVE you. She's worth it. 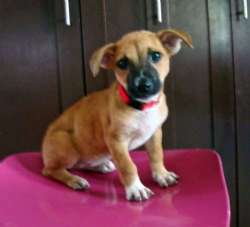 She will flourish with the right dog savvy adopter. Snickers has not been treated like the princess she is, she is 10 lbs and loves to snuggle and would love nothing more then to have a family that will love her. She was given up in TN due to divorce in the family. She lived with them 6 months but they kept her outside. Before that her foster mom says that she acts like she was raised indoors by someone that must have loved and taken care of her. She is very happy to hop up on your lap and watch television with you. She loves to play and run around with the other foster dogs. She is little but don't think she is fragile. She loves the big 85 lb shepherd in her foster home, but hates the cats. She trots right out to do her business when you open the door. She is just adorable! She is available on 1/18. 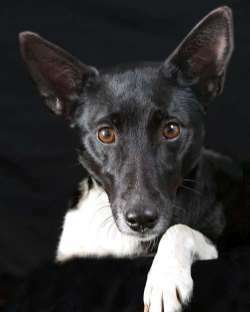 Tamera is a tiny Collie mix. She looks like a 20 lb Border Collie. Tamera is a very shy dog but is gaining confidence in her foster home. She is great with other dogs and would do best in a home who has another dog whose lead she can follow. She's in a home with a senior dog and she is doing well, following the other dog's cues. Her history: she came into a high volume shelter in KY and she was a bit overwhelmed by the shelter, so Save A Dog spoke up for her and she arrived on 12/7 and is in a foster home. She is only 18 lbs and is very quiet and patient waiting her turn to be fed and go out. She requires a fenced in yard so she will stay safe while she is in training. Sudbury and locales close to our trainer in Hudson are preferred. She is fine with being carried and fine with handling. She is good with other dogs and cats. She looks very sweet in this video: http://www.youtube.com/watch?v=e5zdXWamyVg&feature=youtu.be (Bear in mind this is an old video) She is available to meet by appointment only. Her foster mom says about her: Tamera is wonderful! Someone is going to get a well behaved dog. She is a house dog. She was loved by someone. She tries to play with us, but we have not figured out the game yet. Tamera sleeps in her crate and is very quiet. She is completely house trained. As she's in a foster home, we can make a private appointment once you fill out the application online. 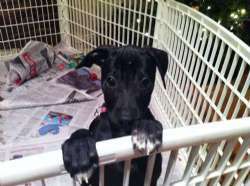 Tobey is an adorable 3 month old puppy who ended up in a shelter. He is playful and affectionate and we're looking for a loving home for him with someone who is home during the day and who has the stability to offer him a forever home. If you already have an application on file and would like to apply it to this puppy, please email adoptions@saveadog.org. Otherwise, better hurry and fill out the online application so you don't miss out. He is available as of 1/4/14. Tripp is a 1 year Golden Retriever possibly Australian Shepherd / Border collie mix, he weighs 38 lbs Tripp is a gentle dog. He came from aTN animal shelter as a stray. He is very happy to be in a warm happy foster home with multiple dogs and will play with all of them. He has ignored the cats in the home, and he plays very gently playing with Jangles, a 10 lb dog . He suffered some abuse in his original home so can be head shy at first. Once he gets a chance to warm up he loves to be pet and will soak up all the love you can give. He will walk on leash but needs to learn that it can be wonderful, He rides well in the car, and never has accidents, he is quiet in his crate, and will go in an open crate to nap. A gentle approach to this beautiful boy would be best for all training, he wants to please so much. He is available 1/11/14. 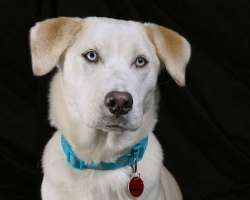 Tye is a Siberian Husky male who 8-9 months old. He is beautiful with one blue eye and one brown. His previous owner said he is a purebred. Tye has been in a foster home with 3 dogs and 3 cats and he gets along fabulously with all of them. He is currently weighing 57 lbs. and is still growing so he can be too much for small children. He’s learning to walk nicely on the leash and not charge out of doors. He is kennel trained at night and rides perfectly quiet in the car. 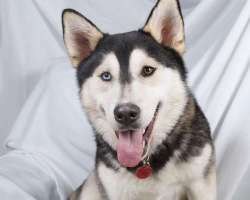 He needs to go to a Husky-experienced adopter who will continue his training. Tye is super sweet, intelligent and wants to please. He will look for a human to bond to. Training, consistency and boundaries are a must. He has flourished in a very short time because of his wonderful temperament. Tye is very affectionate and a delight to be around and will make a wonderful member of the family. He is super friendly and house trained on the dog door. He should be available on 1/18/14 and can go home after his neuter. He is personality plus! Violet was left at the dump like a piece of garbage. This is an all too common occurrence, unfortunately, because people think that dogs can survive on garbage at the dump. It is a harsh place to be for a dog, not just because there isn't enough food but there are lots of dogs who compete for what's there. She was found by some people who live near there and brought to an animal shelter. She was very thin but a couple of weeks in the shelter has taken care of that. She was obviously a well-cared for puppy otherwise, as she is very friendly, a gentle soul with big brown eyes. She loves being with people and is good with both women and men. She loves watching the other puppies in the shelter and you can see she wants to play with them. She is fine in the crate all night, she is housebroken and crate trained. Violet is a sweet, quiet girl. 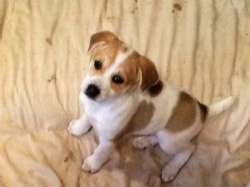 Please be willing to give this sweet little dog a great life. Since she is 25 pounds, she is too big to fit under a seat on a plane, so her only hope is to fly Petsafe, which is more expensive. Her vet fees, crate, ferry to St.Maarten, overnight boarding, and flight to Newark, will cost over $700. Please help us give this dog a chance at a life. If we can get her here, we can find her a loving home. Vixen is a young 6 months old Retriever mix. She was in a TN animal shelter before rescue. 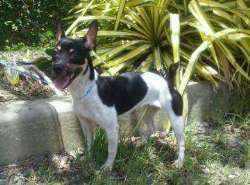 She is playful with other dogs, pretty good with cats and is house trained with a dog door. She is a a pretty little dog, and should stay on the small side. She is learning to walk on leash and ride in cars. Vixi is a little free spirit who was on her own much of her young life, but now enjoys laying on the rug while keeping an eye on you. She would be a great second dog. She requires little and asks for even less, but deserves so much more. A Retriever like Vixen will require regular exercise, socialization and training. She's not a dog who can stay home all day while you're at work. Come meet her at our shelter during our shelter hours, Sat and Sun from 12-3 PM, starting 1/11/14.